For some categories and lots of brands, yes you have to provide invoices. And some you have to get an authorization letter from the brand owner stating you can sell their products on Amazon. But as you can see that hasn't stopped me from making money, and I started in March. I wasn't grandfathered into anything, I've had to apply for everything just like a new seller would today in August. The guy who got me started began a few years ago, and he's grandfathered into just about everything. It's not fair that he can go out and buy whatever Mattel and Little Tikes junk he wants, and I can't. But that's the way it goes. It's not gonna stop me from throwing myself in and trying as hard as I can to knock this out of the park. Thanks for the answer! I've been looking into Amazon FBA for the last month or so and have really focused on the private label piece of it. I'd like to also do some RA but was concerned when I heard about the invoice issue. Your answer definitely helped alleviate my concerns. I wouldn't sell any of these products. Thanks so much for this info. I might go for it when time permits. In the meantime, I've been looking into some bookkeeping softwares. I came across GoDaddy which seems reputable and a nice option, for only about $10/month. Inventory Lab seems a bit overpriced at $50/month, but it might have some extra features that are more tailored to Amazon FBA. I haven't subscribed to any accounting software yet but I'm about to pull the trigger on Inventory Lab. IL is supposed to make it easier to list your products and print out labels, among other things I'm sure. It also has a smartphone app for sourcing that is supposed to show you the keepa graphs for the product you're looking at, which is super handy. I've just been using the Amazon seller app for retail arbitrage and I've been burned several times trusting the rank the Amazon app tells me, but when I look at the keepa history it shows no sales. So I bought something that turned out to be dead inventory. Finally started getting some sales of my FBA inventory. I found some tea kettles for cheap online and bought a dozen at about $12each. With the ebates reward (including a $10 new user credit) my actual price including taxes was about $11. This particular color was selling on Amazon for $35 (most other colors were around $25) so I thought I had found a good deal and calculated a profit of about $7-8 each after FBA fees. By the time I got them to the warehouse the price was down to the low 30s. I tried to be a bit lower in order to win the buy box or at least get someone to click on the other sellers to save a few cents. Nope. Amazon was the lowest price and every time I dropped my price they matched it. Even when I went below my break-even point they followed right along. Finally I dropped the price a few dollars below my break-even price just to see how low Amazon would go thinking that maybe I could trick them into selling out of their stock at a lower price. I finally found the magic number where they didn't go any lower if I dropped down to $21.99. Amazon is at $22.24 and I've got the buy box. Within a few hours I had my first sale and four more after that within a little over a day. I'm losing about $2.50-$3.00 each but since I already decided to pull the plug for the time being I'm happy to just recoup most of my costs on this particular item. Had I looked at the history on CamelCamelCamel a bit closer I might have seen that they were always the lowest price and matched any third-party sellers. Overall a valuable lesson that RA/OA isn't always as easy as it may seem to be. My $8 profit became a $3 loss because I was having to compete head to head with Amazon. If at all possible I don't compete with Amazon. They play dirty. There are plenty of items out there that they don't sell and those are where I'd put most of my focus. The only time I feel comfortable competing with them is when I've found an item on clearance/liquidation and I got it so cheap I don't care about getting in a price war. They will share the buy box, but they don't share it evenly. Early on I found some financial calculators for $25 on clearance at Wal-Mart, selling for over $50 on Amazon with Amazon as a seller. Rank was like 5k. It sold all day long so all I had to do was drop my price a dollar and get a sale almost immediately. Recently I found stacks of new books for $0.50 each at a liquidation store. Amazon was a seller on some of them but I still get a sale about every week or two. I just let my repricer match them and eventually they'll rotate me in the buy box. You have to be patient though and like I said, most times I don't buy an item if they are a seller. I'm super interested in this idea. Anyone doing FBA in Canada? Once you've mailed your items to the warehouse, is it easy to get your items back from Amazon if they don't sell or you decide to stop? I'm posting to follow this. I just launched my first FBA product a few weeks ago. How are gaining reviews? I want to turn on PPC, but feel like I need to wait to get enough reviews to make it worth it? Look at your competitor's listings on the front page of Amazon. See how their listings are different from yours. Do they have more pictures? Do they have better pictures? Do they have action shots? Is the description better and longer? Are they using up all the available bullet points? What are their keywords? Also you can use Google's keyword generator and Helium 10 for keyword research. I've read about vipon.com, where you do a promotion using amztracker.com to get lots of 'VIP' people to buy your product at a discount, review it, then you're off to the races. You all inspired me to expand my Amazon business; I'm giving wholesale a try with a couple of new brands. Depends on how competitive the niche is and what your CPC is. PPC isn't going to convert well without reviews. If the the niche is competitive and the CPCs are high, you are going to lose money on ads. If the niche is non-competitive and the CPCs are cheap, you will probably make money on ads, even without reviews. See where I'm going with that? What seems to be unprofitable at first, might be an extremely profitable investment in the long-term. Finally signed up for Inventory Lab so I could track my actual profits from this side gig. I was selling too much to try to do this manually on a spreadsheet. I'm selling ~$13k/month on Amazon now, looks like actual profit is about 25% of that. Note that this screenshot includes all my inventory cost and Amazon fees, but there's a few outside expenses I didn't include yet. Most likely I've made ~$3k profit for August when it's all said and done. This number is from 8/1-8/29, so there's a few days left that's not reflected. As of this point, I put $12k into buying inventory and supplies and whatnot up to this point. As of today I've received $18k back from Amazon, so I guess you could say I've made $6k or 50% Return on Investment. I started from nothing late March. However, I'm not new to running a business, and I've traded stocks and commodities on the side since 2011. There's been a lot of knowledge transfer from my experience to this business, so I bet I've picked up on it quicker than someone who's never done anything like this before. Do you know if it's possible to just sign up for this around tax day and have all the figures calculated from the year? $40/month is pricey for me right now. There's a free trial but it only goes back 2 months. If you pay you can get all your data synched. I think month to month it's $50, and takes a few days to sync your data. Plus you have to put in all your inventory costs and expenses for it to be accurate. I'm just gonna dump spreadsheets of my credit card transactions and add that up as my expenses. Then take the payouts I received from Amazon for the year and record that as my income. Cash basis is the simplest way to go and I like simple. Also, notice on my income statement that I had $688.76 in reimbursements this month. That's because UPS damaged and discarded an entire box of inventory I sent Amazon back in late June. It took about a month before the shipment was able to be investigated, and almost another month for the investigation to conclude that yes, all my crap was destroyed and it wasn't my fault. It was over $300 my cost for that box. Amazon eventually reimbursed me, along with the potential profit I would have had, but it took a while. You'll need to check each shipment after it's been received and make sure that they received the same number of items you sent them. It's amazing the number of times they say I only sent 3 when I sent 5, or whatever. You have to open up an investigation on each shipment, and you have to wait like a month before it's 'available' to be investigated. There are plenty of times a seller can feel like Amazon is screwing them over, but sometimes it comes out in your favor as well. Amazon says I sent them 2 textbooks that sell for $200 each, when I only sent 1. I would have known if I had more than 1 of those!!! Anyways, both of them sold and I was credited for the sale. That 1 book alone probably paid for a lot of the items Amazon has 'lost' and not reimbursed me for over the past few months. I'm guessing it ends up in a wash. Interested in following this thread. My wife and I finally started selling on amazon more seriously. I've had a seller account for a few years, but never did more than a few random sales because of life. Then I watched two of my best friends both create full time incomes from home through amazon. This year, we made the decision for my wife not to go back to teaching (it had taken a toll over the 6 years and we're young enough to take some chances) and keep her full time at home to attack the amazon model. We started off dabbling in drop shipping, which one of my friends does and makes a good living. We decided we liked the FBA model much better, and just switched to that. Our first shipments just went out yesterday. If anyone is interested, I'd be more than happy to update. A bit of food for thought on how we approached this. The whole purpose of this venture was to build a method to replace my wife's income so she could raise our kids. Right now we don't "NEED" the income and are in a place to take some chances. We set up and LLC and ALL of the infrastructure before doing anything. This included, which I'm thankful for already, purchasing the best software and tools to make the job as streamlined as possible from the jump. This included a thermal label printer, Inventory Lab, and all the extra stuff I knew we would need. I've spent a lot of time trying to set my wife up for success, and so far so good. We spent around $1500 on inventory this week, and plan to repeat next week. All works out, there should be at least an average 25% ROI. If you want to get into this, know the competition is out there, but there is plenty of money to make. Unless you jump into with both feet though, it will be very discouraging at first. Having the tools to make the job much easier is an immediate relief and will make life much better, which in turn will help you grow faster. There's a lot of good info in this thread for anyone thinking of making the jump. I'm interested in this too, although I'm a bit skeptical. Sounds too good to be true. For those of you who are selling with FBA, how much are you making per hour? I'm considering working part time over the next 10 years instead of full time for 5, and something like this would be perfect. But only if it would be more profitable then a low stress job making $10-12/hour. RFord617 - how much did you spend getting set up for your operation? Update: I haven't had much time to source the past month so my sales have flattened and actually dropped about 10%. 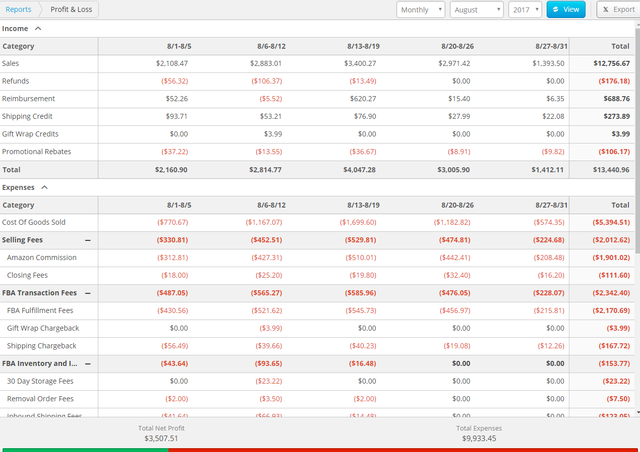 I'll probably make somewhere between $2-3k profit for September. Working about 5-10 hours a week. I just bought a house so for the next month all I'm doing is re-ordering replenishables that I run out of stock of. I realize 4th quarter is coming up and I want to hit that hard end of October and all of November. Amazon just started auto-approving most of the sub-categories, at least for more experienced sellers. I was able to get into all of them and it's awesome. Supplements, baby products, OTC medicine etc. There's a lot of that stuff on clearance in stores and it's high dollar too. I can tell it's going to help tremendously. Plan is to hit Q4 hard with OA and RA, and in 2018 grow into wholesaling. I want to get a virtual assistant soon to source for me on the OA side. It's definitely not too good to be true. It's a steep learning curve, but it's extremely easy once you have everything set up. I've done seller-fulfilled for 3 years. Just got into FBA a year ago. I've made about $12,000 in the last 3 months working about 10 hours per week. Everything is pretty much automated for me now other than buy items online and repackaging everything to ship them to Amazon. At the rate I'm going it's about 100$/hr. I make all of this from my couch. Honestly my biggest problem is the way I source my product. The place I buy from puts limits on what I can buy with each order. So if I want to buy like 100 of something I have to put in 20-30 orders. My UPS and mailman guy also both hate me. I have a huge staircase up to my house. They probably bring a couple hundred packages up those stairs each month. I do have some tips that are a little uncommon but can help you make extra profit. 1. Definitely get InventoryLabs for tax purposes. I use to spend the bulk of my time entering stuff into my spreadsheet. I don't have to do that any more. In fact I made about $130,000 in sales in the last 3 months and it would be a MAJOR headache to do this by hand. 2. Use online portals if you plan on buying from well known stores like walmart/target etc. I received an extra $1500 in cashback for this year alone from doing that. 3. Use credit cards to purchase your items. Manufacture spending on those cards for free vacations etc. My chase ink earns me 5x points back. I can use it to buy gift cards from cardcash or paypal digital gifts from ebay to earn that 5x back. I also use 2% credit cards and cards that offers 0% intro APR. In fact I got a Amex Blue Plus Biz card from Amex. They gave me a $21,000 limit for like a year on 0% APR. That's how I was able to grow my business immensely. This is the points and miles I've about gained within the last year or two. 60k ANA 55k Lufthansa 2 Fairmont Free Nights 75k Mariott 45k SPG 7.5k Hyatt + 2 Free Nights 267k MR 201k UR 201k Delta 110k American (In Progress). I can pretty much redeem the American Express MR points and Chase UR points for an extra ~5,000. I churn credit cards for sign-up bonuses, kind of like what some people do with churning bank accounts. 5. Go and watch amazon videos on how to start becoming an Amazon FBA seller. All it took was for me to watch an hour long video. The first week was nerve wrecking, but it was easy sailing from there. I don't have the exact link, but just search on youtube. 6. I honestly might start outsourcing the prepping of my inventory. There are actually companies out there that can do it for you for a price. Might be a good idea later on if you get big. One of my biggest problems is space in my house as well as having these mail carriers ship large amount of items to my house. They start to ask questions. 7. Inventory often get misplaced by Amazon. They won't always reimburse you for it. I use a 3rd party program to get them to auto-reconcile for me. I spend $40 a month on this like inventor lab. Again think of it this way. I make about $100 an hour because I automate everything. It costs $80 for me to have programs find my lost items and to record my sales. That's an extra hour I might have to source products or just chillax. It's a worthy investment. 8. Slickdeals is not too bad of a place to look for inventory to sell. They're one off items, but money is money. Here's my IL. I'm jealous of you though hodedofome I could get the same ROI lol. On the bright side I do earn a lot of points doing this though. Thanks for the tips. $12k profit is really nice, congrats. And I thought I was doing pretty well for my first 2 months lol. I'm averaging $1500/month in sales doing RA only and work maybe 5 hours a week. But this number is also growing as I find the right things to sell. Last week I found 57 copies of a very popular book, which would give $6 profit each (potential $335 profit). My returns are similar to hodedofome's. I'm finding difficulty in scaling everything up (replenishable items, online sourcing, etc). But I haven't invested in the powerful software programs out there yet. Crusading Angel - thanks for the tips. I was on the Amazon Sellers Forum and read a lot of complaints about lost inventory. Sounds like it has gotten worse in the last few years. That concerns me. Can that be written off? Or do you just have to eat it? My thanks to all the experienced hands posting on this thread. I've been skeptical of some of the gurus claiming great Amazon FBA ROI. Hearing of the success of fellow Mustachians is reassuring. Whatever complaints people have about Amazon, it's not enough to make them leave and go somewhere else. This is the cost of playing on the greatest e-commerce platform in the history of the world. If I make a few thousand per month working a few hours a week, and Amazon screws me over on a few hundred bucks a month, am I gonna complain? Sure. Am I gonna leave? The only thing that will get me to leave is if Amazon closes my account. I just eat the inventory. Either give it away, re-wrap it for gifts, or use it. I got enough Gain multi-purpose spray to last me a year or two. I have enough 'miracle cleaning cloths' to take care of female family's christmas gifts. I have enough slimey goo creation kits for a few years of my kids' birthdays and whatnot. Just comes with the territory. Following! I have been interested in selling on Amazon FBA, but am nervous to get started and not sure of what to sell. Will check out the podcasts and sites mentioned here! Sometimes you just eat it. Although as I mentioned there are sites out there that will help you with this as well. I mentioned Invy Lab in 7. for data keeping. Forgot to mention the thing I use for lost inventory. I use Refund XRay which is $99 a year. They allow you to check twice a month for any lost inventory. Essentially you download several reports (they have videos to show you how to dl each report) and then you upload it into their system and they automatically read out your lost inventory for you. I then copy and paste the information and open cases with Amazon. It has helped me get some money back, but it's a little glitchy and annoying to do manually. This past month for example I checked some inventory and amazon had already reimbursed me for some and they still gave me the inventory as missing. It's definitely worth the $99 since I'm basically at 300k in sales at this point. I'm not sure of the exact number but I've definitely gotten way more than $99 back. I also use refundmanager. I originally used this a few months ago when I was smaller and I still do. They charge you 25% of what you get reimbursed back. They automate everything and opens the case on Amazon for you. They've helped me find ~400 in the last 10 month. I'm sure both of these missed some inventory, but I've definitely got reimbursed for probably 1k+ that I probably wouldn't have gotten back while paying only $200 in fees. Refundmanager is great if you're small time while Refund Xray is great for bigger sellers. Sorry for the late reply btw. Haven't checked mmm forums in a while. Oh I found the youtube video that helped me get started with my amazon fba business I mentioned in my post. I'll post it here for anyone that's interested. Feel free to pm or post here with your questions! For some of the more experienced folks here do you have an estimated all in cost to start doing this? Do you feel the market is saturated due to ubiquitous tools like Jungle Scout? I'm thinking of trying to get back into this but it feels like the online/retail arbitrage space is pretty crowded and that Amazon is making it harder and harder for those who aren't legitimate resellers. It looks like finding a wholesaler, or better yet a manufacturer, of a product that is already selling would be a lot more stable. You could just replenish your inventory and take advantage of the bulk pricing. Every time I looked for profitable things to sell at a typical store like Walmart or Target it was almost all restricted or wouldn't even break even after all of the fees. The barriers to entry are minimal whereas if you could build a relationship with a manufacturer or wholesale, especially with a restricted brand, you wouldn't face the same kind of competition. Thank you all so much for sharing your awesome experiences! I have a question that I think applies to retail arbitrage too, though I'm specifically looking to do private label. I see a lot of people talking in Facebook groups and on podcasts about big income numbers, but then they also say that they put all of that money back into their business to buy more inventory. That makes sense, to a certain extent, but then does the cycle ever end? If you're always putting 99% (or some other high number) of profits into buying more inventory, are you ever really making a profit? And for someone who does this as their full time gig, how do you make a living off of it? I would need to make enough money to not only buy inventory, but pay my rent, groceries, and other life expenses. What do you all think? Is this doable? Thanks for your advice! I highly recommend the EcomCrew podcast and website - https://www.ecomcrew.com/. One topic they frequently discuss is how difficult it is to manage cash flow in an inventory based business. If you buy $5,000 of stuff from China it might be three months until it's delivered and ready to sell. If it takes another six months to sell through that order you have your $5,000 locked up for 3-9 months. Then three months after you start selling you have to re-order and you need another $5,000 but you've only earned maybe $4,000 from selling the first half of your previous shipment. If you're growing and need to place even larger re-orders then the problem would become even more acute. It's a balance between growing the business and taking out enough to live on. In general you'll probably need to have some other source of income for the first few months if not first year or two. If you expect to be able to immediately start pulling out thousands each month to live on it's not very realistic unless you have a pretty substantial amount of startup money. Many businesses are not immediately profitable, and even if they are, it's probably not enough to live on until you grow larger. Thanks for your input, Michael in ABQ. I'll definitely check out that site. What's your opinion on how long it takes to start making a profit than can be withdrawn from the business - maybe not enough to live on, but something to help support oneself, like $1000 per month? Good question but I'm probably not the one to answer it. My brief foray resulted in about $400-500 in sales over a few months with basically no profit to show for it. Some others in this thread have done far better. If you're doing private label then obviously there's going to be more upfront costs and a long timeframe - especially if you're sourcing internationally. If you're doing online or retail arbitrage you could be profitable within your first month though I doubt you'd be able to pull any significant money out in the first few months either way. I really suggest using slickdeals and looking for places with "sales/holiday sales" if you're going for the traditional retail arbitrage route. I.e. black friday last year (2016?) they were selling mario 3ds (xl or something) for 100$ before tax at target. I bought 3 of them from target and went and sold them for $50 profit each. I knew this was a deal because I owned an older version that I bought for ~$200. (I should have bought more lol.........). Although I didn't because I thought there was going to be a large influx of sellers deflating the price. I feel like it really helps you a lot more if you find a product or category you're interested. Then go and search other websites out there that may or may not be big names to find your products. Slickdeals can really help with that since they allow you to search for deals by categories. I essentially have 0.0 replenishable items on my amazon store. However, I know that every few weeks or every few holidays they hold a sale. Hence I'm essentially able to keep investing money back into items. I mean of course the wholesale route works too. I'm just saying it's entirely possible to still the retail arbitrage group. I mean some of the things I sell have sales ranks of 1000 or less and "most" of the time I still make profit off of them. I'm just trying to prove that it's not too crowded per se. You just have to work out the angles. Granted I'm sure there are tons of other sellers out there making more than I am through wholesale. Let me give you my honest opinion. Personally I don't think it's never too late or too early to start withdrawing your money. I'm sure you know this already, but a lot of time it takes money to make money. My advice when you're first starting out is to take out what you need to live your average daily life. Then when your business grows take out a little more and so on and so forth. It's like compounding interest. The more that you invest in your business, the more you can make (granted that your business is doing well and making a profit). My situation is different than some other FBA sellers because I solely use credit cards to make all of my purchases. I pay every balance off each month so don't worry xD. I essentially put money into my business and then cash it out every month. I personally take it out profits for basic daily cost of living. Other than that I take money out when I know I can make higher ROI through other methods to diversify my cash flow. Those of you doing retail or online arbitrage. What tools are you using to source inventory? I've found a few things on slickdeals like a $20 Yankee Candle that was $1.70 after tax at Walmart when I rang it up even though the display still said it was $15. One store nearby supposedly has 8 more in stock so I'm planning to stop by on the way home from work. Another store 50 miles away shows 39 in stock and even with shipping and Amazon fees I figure I'll net about $10 each. Hard to justify driving all that way if it's a bust, especially since I have to listed it as used - like new since I'm restricted from selling it in new condition. Got another one-off deal at Macy's with a $10 mail-in rebate. I found brickseek.com which shows you current inventory for various deals at Walmart, Target, and Lowes. Thinking about signing up for the premium version which is $10 a month. I pass by a few Walmart stores on my way too and from work so it's not to hard to stop in and check if a deal is actually in stock. Are you mostly finding things at big box retailers like Walmart, Target, etc. or are you finding other sources? There's a lot of stuff on clearance at Walmart, especially toys, but it's virtually all gated. I found one non-gated brand and sold a few. When I went to list another it was now gated but I did get auto approved. Tactical Arbitrage is very powerful for OA. It's pretty expensive though at 150$/month. I suggest you start with RA. You only need the Amazon Seller app to get started. Go around and scan everything. It will start to open your eyes on what's profitable and what's not. You need to check out a bunch of stores in your area - you will come up with a list of stores that are worthwhile. Well I found some Yankee Candles at Walmart that were only $1.70 as they were from last season (normally $20+). Looks like they still sell a few everyday even during the rest of the year. I was only able to find a couple in-stock after checking a few stores but my net margin should be about $11 on each, depending on shipping costs (edit: shipping turned out to be about $13 thus reducing actual profit to about $6). Another Walmart 50 miles away supposedly has 39 in stock but I'm not sure I want to risk driving all the way there only to find out they have none. www.brickseek.com is a neat resource for checking inventory at Walmart (and a few other stores) but so far it's been pretty hit or miss on accuracy. It's pretty nice seeing an item that's still marked $15.87 ring up as just $1.70. I'd never know that it was marked down so much without that resource. Also picked up some 8-packs of Gillette Razors for $5.00 that are normally $25-30 but I'll have to sell those on eBay or maybe just use them myself. Too many counterfeits for Amazon to even allow you to request approval to list them. Finally, purchased some bags that cost $85 but are selling for $150 on Amazon. I couldn't determine the exact sales rank because it was only showing the rank within a subcategory but they're also selling on eBay for about the same so I don't think I'm in any danger of having to sell at a loss. Judging by the number of reviews they must be selling a decent amount and Amazon isn't one of the sellers. The online retailer had 31 in stock but I decided 7 was enough. $2,635 is a bit more than I'm willing to tie up in inventory on a single item I'm not too familiar with. With shipping and fees I figure I should make about $30-35 on each one. How do you handle taxes for this? For anyone who has been doing this for more than a year, what does Amazon send you in terms of a 1099 or other tax documents? Do they report your revenue net of any fees or shipping that you purchased through them or just your gross sales (which would presumably include any shipping credits) leaving you to explain to the IRS that your COGS and expenses accounted for much of that. I don't really want to go to the trouble of filing a Schedule C just to report that I lost $5 on about $600 in sales (probably more if I accounted for some mileage, to say nothing of my time). The extra $40-50 TurboTax would charge me is obviously not worth it since even if it was pure profit I'd barely pay that much in taxes. So far 2018 is proving to be more profitable and I'm keeping better track of my income and expenses and I plan to get a business licenses and start quarterly filings with the state (and I suppose the federal government though I need to research the thresholds on that). Edit: I just went looking to see when Amazon would send me any tax documents and it turns out their minimum threshold to send out at 1099-K is $20,000 in gross sales or 200 transactions. Since I didn't come close on either I don't think I need to worry about reporting any of this for tax purposes. All platforms.... Paypal/Ebay/Amazon/Etsy/etc are required by the IRS to send out a 1099-k on anything over $20,000. But just because they don't send you the 1099-k does not mean you are exempt from filing on that money if you are running it as a business. Here is what it is about..... the IRS let's you sell up to $20,000 of your personal stuff through those platforms. They figure if aunt Agnes died and you want to sell her stuff on Ebay then that is fine up to $20,000..... but if you have it structured for a business and they ever find out, you will pay. Now the $1 million dollar question is..... would they ever find out? A few they have, most they haven't. I don't have time to read this whole thread so I don't know if it has already been said, but I just want to point out to beware of the state tax implications (both sales and income) of doing FBA. From a few google searches it's tough to find much online right now, but I have heard of two things that may be happening - state's subpoenaing Amazon to get seller info, then enforce tax and the other is requiring FBA sellers to file in every state that Amazon has a distribution center since inventory apparently cannot always be tracked. There was a VDA program to clear up any prior liabilities, but that unfortunately ended towards the end of 2017. Washington State basically forced Amazon to start collecting sales tax on behalf of third-party sellers. I suspect that will be the way it will start going in the future. While it can certainly be argued the sending inventory to a distribution center in another state creates a sales tax nexus there, it's just not realistic for hundreds of thousands, if not millions, of third-party sellers to try and collect and remit sales taxes in all those states. When Amazon and states offered amnesty last year there were very few who decided to participate. For instance, if you enable inventory placement services you can ship a box with 100 widgets to a single Amazon warehouse. They will then redistribute that to other warehouse around the country to make it cheaper and faster to ship to customers. I don't think Amazon will tell you on every single transaction which warehouse shipped that item. Sales tax generally only applies if the buyer is in the same state as the warehouse. Amazon could (relatively) easily start collecting and remitting sales tax on behalf of all third-party sellers using FBA. Once states realize that it is a lot easier to go after Amazon for millions of dollars in lost sales tax versus trying to track down tens of thousands of sellers to try and squeeze a few dollars from each, I think Amazon will start taking care of that. After all, they own the customer, the own the system, they control every aspect of it except for this one liability that they try and place back on the sellers.